Yesterday, Ford pulled the wraps off the Tourneo Custom the automaker first previewed weeks ago at the Geneva Motor Show. The Tourneo Custom — Ford wants to very clearly delineate this from its similarly initialed "Transit Connect" — is the car maker's European light-duty commercial passenger van. It probably doesn't help that they used to sell the Tourneo as part of the Transit Connect lineup. That said, it's capable of carrying eight or nine people depending on whether you've got the short or long-wheelbase version. Like the concept, the new Ford Tourneo Custom features an almost car-like appearance. Also, like the concept, don't expect it to hit U.S. shores any time soon. 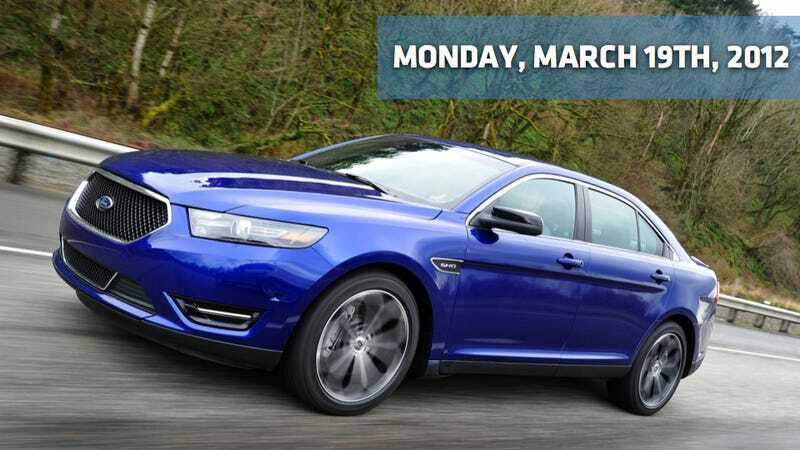 With the mid-sized Fusion long since eclipsing the full-sized Taurus as Ford's best-selling car, Ford is trying to make a stronger case for the facelifted 2013 Taurus. According to Automotive News, the Dearborn, MI-based automaker now plans to market the top-of-the-line SHO version as "upmarket" in an attempt to win customers who normally would buy performance sedans from BMW, Audi or other luxury brands. Huh. What about the newly-designed soon-to-be-unveiled "production" version of the Lincoln MKZ concept we saw in Detroit? Shouldn't Ford be finding a way to use that — or the MKS, Lincoln's version of the Taurus — to go after other luxury brands? Could it be that Ford's already given up on Lincoln, and they don't even expect the MKZ to be the "Hail Mary" the "luxury" brand needs to survive the slashing stare of Alan Mulally? Automotive News claims that Porsche will build a plug-in hybrid version of the Panamera sedan starting in 2014, sources familiar with the situation said last week. The plug-in hybrid likely will come to the United States, but the timing is unclear, a source said. With rising gasoline prices expected to peak at about $4 a gallon in May, it should produce a "mild" effect on most used-vehicle prices, analysts at NADA Used Car Guides say. Apparently, used SUV prices are still Teflon-like. That is, unless prices pop up to $5 per gallon. It's that point when NADA thinks we'll start to see used SUV prices plummet. That's not stopping prices for used hybrids from making a move in the opposite direction. Kelley Blue Book claims prices for used hybrids jumped 3.6% to average $16,974 and prices for the Toyota Prius were up $1,370 in February. Bloomberg reports this morning that with rising incomes and declining violence, so is a demand for a middle-class lifestyle that includes autos after years of conflict following the U.S.-led invasion that ousted Saddam Hussein. The best part? One of the most popular models is Chrysler's Dodge Charger, nicknamed "Obama" after the U.S. President by Iraqis. Although he did linger when he saw the Charger at the Washington DC Auto Show, the President appears to be a bigger fan of its platform-mate, the Chrysler 300. You know, considering he owned one. 6th Gear: Did You Know Luxury SUVs Sell Well? In L.A.? The Hollywood Reporter has noticed a "new" trend of affluent L.A. parents loving luxury SUVs and crossovers. Their visit to a handful of schools reveal the prep set has zeroed in on the Audi Q7, Porsche Cayenne, Lexus RX, BMW X5 and Mercedes-Benz GL for shipping around the kiddies. The cars are popular because they offer a combination of perceived utility and stylishness cloaked in the sometimes dubious prestige of luxury brand names. Basically, what they found is that when you slap a luxury badge on any old people-hauler, put it up on big tires, and give it a bunch of luxury-like accoutrements — people will buy 'em up like hotcakes. Wake me up when they find the "green" trend next.